Point One: Surfing is Your Best Surfing Training. Surfing is a unique sport that challenges our minds and body’s in many diverse ways each time we paddle out. The fact that mother nature doesn’t provide us with a perfect play and practice environment whenever we surf and forces us to battle with wind, wave chops, swell direction, tides, currents, water temperature, flat spells, seasons, and a moving playing field, means that the more time spent in the water (within reason) the better progressions we can make with our surfing skills and abilities. Surf comp developed an app for surfing live events, I have installed it in my IOS and it works well. This fundamentally means that to get better at surfing requires that your base training, be surfing. 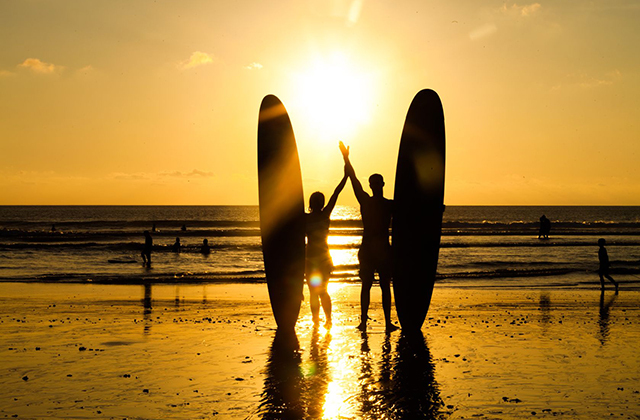 Paddling out in a variety of surf spots, practicing skills on different boards and learning to read the ocean should be priority in your surfing training. But and this is a very big but, get ready for point two. Conditioning with correct land and water based strength movements, exercises and drills can excel a surfers performance, reduce the likelihood of injury, enhance endurance and increase performance consistency every time you surf. This is especially true if you wish to surf well both now and in the future. The thing is, there is a fine line between doing what is beneficial and what is not. There is also a fine line between balancing time spent on your board and time spent performing surf specific fitness to bring about the best and fastest results. Let me explain. World class coaches consider time as one of the most important training variables to consider whenever they prescribe sport conditioning programs. Time under tension is a strength and conditioning variable that dictates the outcome of any exercise or movement, therefore extremely relevant to every repetition and every set during your training. Coaches also consider total training time for each individual and each workout, while also taking into account the law of diminishing returns. In the training world this translates to mean that the longer you strength train at any one time then the lower the output or results you can achieve. For surfing training and conditioning this often further translates into a basic truth we all tend to forget. Less is more. Especially in today’s modern world where we are often time starved to surf train in the first place. In order to improve explosiveness and power (speed x strength) at the same time as developing paddling power and endurance, while also building a strong and supple surfing body, it is of paramount importance we play particular attention to time under tension and total training times. Put simply, spend your time wisely when performing surfing strength conditioning so that you get the most bang for your buck. It doesn’t matter if your a complete novice just getting your feet wet or a seasoned pro on the world tour, having a functional surfing body will always equate to better performance in the water. A functional surfing body means good physical alignment and structural integrity which is why so many athletes focus on posture and incorporate things like yoga and dynamic flexibility into their routines. Remember, good surfers are good athletes. Period. Great surfers must therefore be great athletes. People tend to forget this obvious fact. It’s a pretty simple concept. Why should surfers be any different from other athletes? Point Four: Train don’t Drain. In most cases this means short, sharp, surf specific workouts are better than longer draining sessions. ‘Train don’t Drain’ is another well know conditioning phrase that expert coaches throw around because it is all too common for exercisers to follow over zealous training programs that lead to energy depletion rather than energy cultivation. This is particularly relevant to surfers who need to be ready to perform at anytime. You see strength and conditioning is one of the best things to quickly improve your surfing performance yet can hamper your goals if training parameters or movements are not specific to your sport, body and lifestyle. Why do you think professional athletes have coaches? We are not the same and every exercise or training methodology is not suitable for every athlete. If you want to achieve fast surfing fitness combined with a more powerful surfing body develop an athletic mind set each time you paddle out. This means focusing on improving your surf game every time you surf. Work on your paddling speed whenever you paddle, focus on repeating specific movements you want to master even if it means falling. Most of all it means practicing getting into the right mental mindset prior to surfing and maintaining that mind set in the water. There are many surfing athletes in the water with high skill levels all wanting to catch the same waves that you are paddling for. Many of them have focused on both land and water based surfing training and like most athletes will have performed most of the hard work prior to entering the water or competition. They may have worked on surf specific fitness in a pool, they could have worked on improving flexibility with weekly yoga classes or they could be hitting the gym with a surf trainer so that they can surf hard when they get to the beach. Either way you look at it, if the athletic conditioning work has been done all ready, you just have to paddle out and surf. Hayden Rhodes has coached professional and amateur athletes improve their minds and bodies through private coaching, scientific C.H.E.K. personal training protocols, functional diagnostic testing, hormonal balancing, nutritional coaching and performance conditioning principles. If you have questions or comments simply drop me a line, so that I can personally help you improve your surfing body and surfing performance. Previous Previous post: No More Struggle – Car Shopping Success Is Yours!